A section of the roof at Ukraine’s Chernobyl nuclear plant collapsed yesterday, causing a worker evacuation – but there has been no increase in radiation at the site, authorities there have been at pains to emphasize in international media. Chernobyl spokespeople said radiation levels remained unaffected after the 6,500 square foot section of roof over the machine hall at the exploded reactor No 4 gave way. No one was hurt when the roof buckled. The French firms of Vinci and Bouygues, who are building the roof structure, said they had evacuated around 80 employees as a precaution, according to the Daily Telegraph. A new, giant, arch-shaped confinement is currently being constructed over the old sarcophagus covering Chernobyl’s reactor No 4. The construction of the new shelter was not affected by the accident, said Anton Usov, spokesman for the European Bank for Reconstruction and Development, which runs the $2 billion project co-sponsored by the bank and international donors. The 1986 explosion and meltdown at Chernobyl’s reactor No 4 was the world’s worst-ever nuclear accident, rivaled only by the Fukushima triple-meltdown of March 11, 2011. Both accidents were classified level 7 events on the International Nuclear Event Scale, but radiation released from Chernobyl disaster spread much further than that from Fukushima so far. 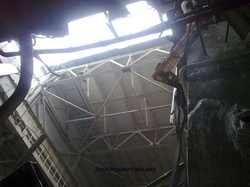 Though yesterday’s incident led to no casualties and no increases in radiation levels, the roof collapse is bound to revive concerns about the condition of the defunct power plant. “This shows the importance of upping the tempo of work to build the new sarcophagus at Chernobyl,” said Nils Bøhmer, Bellona’s general manager and nuclear physicist. “It also shows that Japan must be very focused in its efforts to secure the radiation in the destroyed reactors at Fukushima,” he said. “There are no changes in the radiation situation at the Chernobyl nuclear power plant or in the exclusion zone,” Chernobyl’s administrators said in a statement. The affected area was about 50 meters away from the cement sarcophagus built in the aftermath of the 1986 disaster to contain leaking radiation from the exploded reactor, Chernobyl spokeswoman Maya Rudenko told the Associated Press. 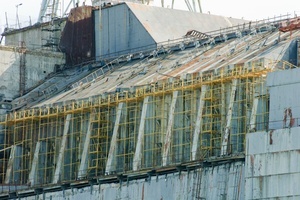 The huge new containment structure is currently being built to slide over reactor No 4, amid concerns about the long-term viability of the existing cement sarcophagus, which over years has developed cracks – though they have not released radiation. The concrete shell’s construction is headed up by the French firms. The explosion at Chernobyl’s reactor No 4 – when Ukraine was still part of the Soviet Union – sent a huge plume of radiation across Europe. Some 115,000 people were evacuated from their homes in Ukraine, western Russia and Belarus. The Soviet government under Mikhail Gorbachev denied the catastrophe for several days until mounting evidence from radiation monitoring authorities in Nordic and European countries and seismology institutes as far away as Great Britain and the United States became too overwhelming to ignore. The number of people who died because of the accident remains controversial, but thousands – hundreds of thousands by some estimates – are thought to be at higher risk of cancer as a result of exposure to radiation. The Ukrainian government has meanwhile stood by its initial 1986 death toll of 31. The area around the plant is heavily contaminated and a 30km exclusion zone is in force. ANALYSIS: Roof collapse at Chernobyl: What does it mean for Russia’s aged Chernobyl-type reactors?